Greetings to all athletes registered in the 2nd annual Winter Combine! With our event just days away, please make note of your check in time, warm up time and testing time for your division. With 150 registered athletes, we have strict timelines in place , so it's VERY important that everyone check in on time and for your correct division. Each athlete will be given a card at the check-in table, that details what testing station they start at , and then outlines the times they need to be at each subsequent station. It is the athlete's responsibility to follow the times on the card and check in with the volunteer at each station. If testing has started and they have not checked in, their name will be called once, and then testing will start, if they arrive after testing has started, they will be accommodated at the end if possible. At the registration check in table, each athlete will also be given an RFID band to wear during the Combine , that has been pre-programmed with their information. Results are then made available in real time. The email address given with your online registration is the one which will be used to provide notification of personal athlete results for a period of 30 days. Athletes will only see their own results and no one else. We will post the winning results and average results per station on our website. Football cleats, athletic wear. Bring mouth guard and water. Official Combine T-Shirt will be provided. Parents and spectators are NOT permitted on the field during the combine. Please sit on bleachers set up on the field, or outside the field where the tables are set up. No standing/sitting on the field sidelines will be allowed. With real time results available for the combine testing, we will do our best to announce the MVP winners and 40 yard dash winners at the end of each time slot. The Aexos shirt winners will need to provide us with their name, contact info, size and will also be able to select the colour shirt of their choice. Aexos will then send us the shirts and we will let you know when they are available for pick up. HALO™ is an innovative compression shirt designed to perform like equipment by reducing whiplash of the head and neck during impacts in contact sports. The advanced base layer provides postural support that works with the natural movements of an athlete, without affecting range of motion or mobility. 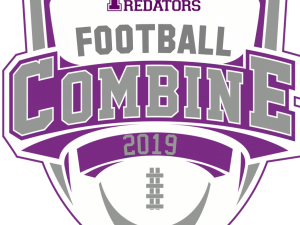 The draw will take place at the Combine on January 5th and the winner notified by email and posted on our social media. Special thank you to the Hamilton Tiger-Cats for providing this generous prize. With the generous support of our main event sponsor we are able to provide a truly professional combine experience for our athletes.